A Strange Brew “Lost Tomb” Motif Today, Apparently | Comics I Don't Understand - This site is now being updated daily at http://www.comicsidontunderstand.com. Please change your bookmark if necessary, and notify any web site with a link to the old address. Before the advent of digital photography, anyone who had a camera had undeveloped film. It was a rule. Often that undeveloped film stayed undeveloped for YEARS. When Egyptians were buried they would be buried with things they would need for the afterlife. 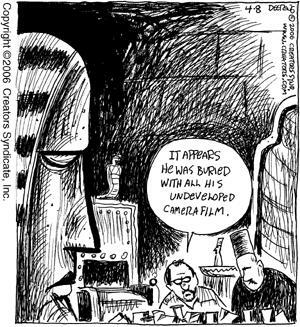 In this case the Egyptian prince was buried with his undeveloped film to take with him and have developed in his next life. It could also be a comment comment on how old and obsolete film technology has become. Though I don’t think cameras were around during the rein of Cheops — though that surely would answer the question of how the pyramids were built. Nicole, are you suggesting that the pyramids are built out of cameras? My experience at least is that there was always one unfinished roll of film left in the camera. But, generally, when a roll was finished, you’d take it to be developed. That’s why I don’t understand the reference to “all” his undeveloped film. hia — some people procrastinated and didn’t necessarily take film in to be developed right away, sometimes waiting until we, er I mean *they*, had 2 or 3 (or 5) rolls that needed to be developed. Of course by that time, one had forgotten what was on the rolls…. This joke wasn’t too difficult to grasp. People never developed their camera film and still don’t. Thanks to digital photography, we can just pop in our SD cards into a machine somewhere and chose the pics we want to print.